Live Auction preview working fully now! Some of you will have experienced issues with accessing the auction preview at times over the last two days. I apologize for the inconvenience and am writing now to assure you that all is fixed. We encountered some unexpected performance issues, and our website developer has implemented some changes that have remedied this! Click here to preview of selected auction highlights on our website, which will continue to expand as we move towards final completion of sale preparations. Please note that the complete auction inventory will be available online from next Wednesday, and that print catalogues will not be available until the day of the Auction. Additionally, we invite our local customers to visit us for a preliminary viewing of available lots, this coming weekend. Alliance Coin & Banknote will be open both Saturday (10-4pm) and Sunday (10-5pm), for your viewing pleasure. 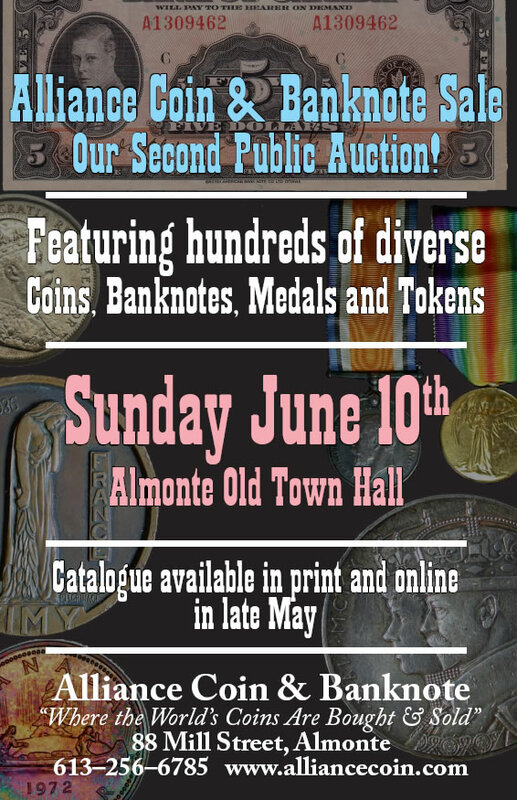 I am delighted to report that we continue to steam ahead with preparations for our second annual Alliance Coin & Banknote live public auction, to be held in the Almonte Old Town Hall on Sunday June 10th. The sale will begin at 10:00 am, with a one-hour break for lunch at noon, before continuing at 1:00 pm. This will be a very diverse sale of 500+ lots, representing virtually every area of the coin, banknote, medal and token fields, as well as some truly unusual items in our “Artifacts, Collectibles & Bulk Lots” category. With estimates ranging from $10 into the thousands, there will be something offered for every collecting level and budget. Please note that due to the unfortunate delayed receipt of some important Canadian material, printed sale catalogues will not be available until the actual weekend of the auction. Fortunately, however, complete listings will be available for both viewing and advance bidding on our website by mid-week prior to the auction, once we are able to complete the catalogue and assign final lot numbers. We do sincerely apologize for the resulting very tight timing, but remain confident you will find it worth the wait. Beginning this Tuesday the 29th, we are delighted to begin featuring a preview of selected auction highlights on our website, which will continue to expand as we move towards final completion of sale preparations. Additionally, we invite our local customers to visit us for a preliminary viewing of available lots, this coming weekend. Alliance Coin & Banknote will be open both Saturday and Sunday, from 10:00 to 5:00, for your viewing pleasure. As always, my family, staff and I warmly thank you for your continued patronage, and I look forward to your participation in our impending public sale! Please note the addition of a short list of corrections & clarifications pertaining to our Sale Catalogue. For those attending our sale in person, please note that lots will now be available for immediate pick-up after the sale at our store (88 Mill Street; a three-minute walk from the Old Town Hall), beginning at 5:00 pm Sunday evening. For offsite bidders and/or those who prefer not to stay until the conclusion of the sale, all unclaimed purchases will be invoiced and available for pick-up/shipping within 48 hours, as per the original terms detailed in our Sale Catalogue and on our website. Planning to attend our Sale in Person? In order to assist us in making sure we have booked the correct sized room, it would be very much appreciated if those planning to attend could confirm your plans to do so, as well as the number of people that may be joining you. Please just send a quick email to sean@alliancecoin.com. View the complete auction information and catalogue on the website. We look forward to seeing you this Sunday, April 2nd! 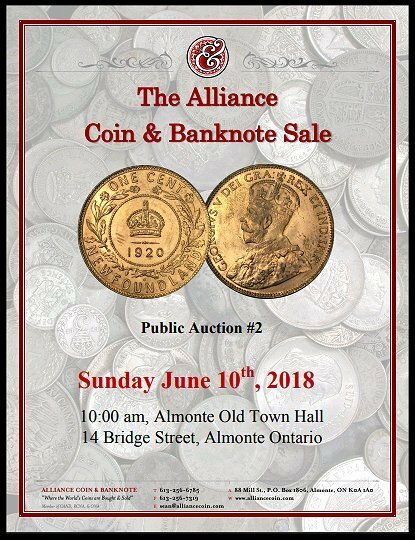 I am truly delighted to present The Alliance Coin & Banknote Sale, our first public auction here in Almonte since opening our gallery 12 years ago. It will be held Sunday, 2 April 2017 at the Almonte Old Town Hall from 10am to 5pm. Among the 600+ lots in this sale I believe there will be something for everyone, and with No Buyer’s Premium, the opportunities for bargains will be plentiful and transparent. We look forward to welcoming our live bidders on sale day, and invite you to explore our historic downtown Mill Street (just steps away from our store and from the auction venue, at the Almonte Old Town Hall) where you’ll find no shortage of cafes, antique shops and galleries to while away the lunch break. 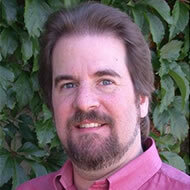 I am very pleased to welcome my good friend and colleague, David Giles, who will serve as our auctioneer. 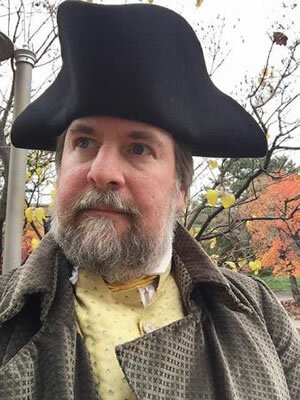 David brings with him significant experience as caller for the venerable Sparks philatelic auctions in Ottawa, and I am confident he will provide a fun and well-conducted sale for all in attendance. With all the diversity you have come to expect from Alliance Coin & Banknote, we promise a fun auction experience and the potential for some really great deals! You can download the complete catalogue and find out all the auction details, including viewing of lots and placing bids, on the Alliance Coin & Banknote website.